As you have gathered by now, I am hopelessly addicted to everything puzzling. I'll read books about them, I collect them, I photograph them, I write on-line about them, I go to puzzle parties and a lot of my favourite people in the world are puzzle people! However, I particularly love my fine wooden masterpieces! Last weekend I confessed to you that I had spent an absolute fortune on Brian Young's (MrPuzzle) 2012 limited edition burrs. My wooden puzzle collection is my absolute pride and joy. BUT I do still play with puzzles made of other materials - they tend not to stay on show unless they are made of a lovely material like glass or aluminium (like the puzzles from Wil Strijbos) or they are hand-made with huge amounts of skill like Traiphum's Hexaminx, Megamorphinx & cuboids or the special cuboids I have from Hunter. Most of my plastic and wire puzzles tend to stay put away in a drawer or cupboard and are just brought out when needed. I do enjoy owning them - I can safely take them to work and torture my colleagues with them safe in the knowledge that no-one will break them. I don't have to worry about an orthopod and his hammer!! But now I have finally found a mass produced plastic puzzle that is going to stay on show and close to hand for the foreseeable future despite looking like a child's toy! 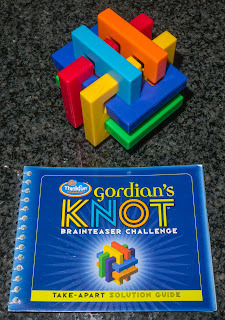 Yes this is the Gordian's knot burr puzzle made by the educational toy company - Think Fun. I had seen pictures of this about for the last year or so and never gotten around to buying it. Partly because it looked so garish and "plasticky" but also because I had been focussing on so many others. But recently Sven from the Twisty puzzles forum wanted to sell off a large part of his collection and amongst those he had on offer was this puzzle - it cost me about €10 which is a bit cheaper than the brand new cost and despite being second-hand it was in pristine condition. It arrived a few weeks ago along with a few twisties and I just got around to it this week. It comes assembled as a 6 piece board burr in a good quality, vibrantly coloured plastic and also has a solution booklet with it (thank you Sven for ensuring this was also in perfect condition). The booklet is cleverly done in that each page is a single move and it you work in one direction through the book it is a set of disassembly instructions and if you turn it over and work the other way it is an assembly. I have very little experience with board burrs so far but really needed something a bit harder than trivial but not excruciating! I need to solve this before I have the courage to attempt the Fermium puzzle that I bought from Arteludes last year. That one has been sitting on the shelf above my desk taunting me ever since I got it. To be perfectly honest, it terrifies me! Now the Gordian's knot has an interesting history behind it... it was initially designed by Frans de Vreugd who is one of the editors of the CFF journal and a very major figure in the puzzle world. It would appear that up until fairly recently the puzzling community had contented themselves with six piece board burrs, that is, six boards flat together in three pairs forming a 3-axis burr. Jim Gooch of Oregon suggested to Frans separating each board from its partner by a one unit space and then Frans designed a computer program to search for such puzzles. Apparently this search was unsuccessful in finding any that were stable until he came up with one using zigzag pieces. Thus his first separated six piece board burr puzzle was named 'ZigZag' and it had a disassembly level of 7, 9. Some weeks later Frans designed another puzzle of level 17, 4. It proved to be very difficult to disassemble and assemble and it was named 'Torture'. Finally, Frans made one hard push to see what the most complex possible separated six piece separated board burr puzzle might be and his computer program came up with a phenomenal puzzle with a tremendously high difficulty level 28, 21, 9, 8, 3! He called this one 'Extreme Torture' and many said that no human could be expected to solve it unaided with a minimum of 69 moves to totally disassemble! The initial commercial set was made by George Miller in acrylic and later Think Fun mass produced it in plastic. The pieces can be assembled 8 ways but the best one has the very high level. There are one or 2 reviews on line - Gabriel reviewed it in 2010 and stated how difficult it was. 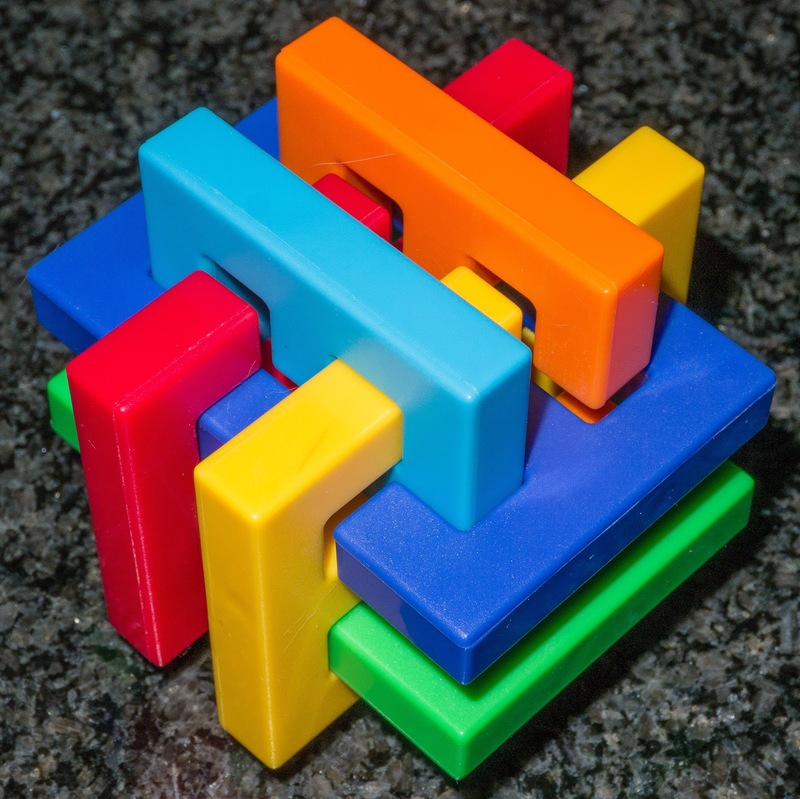 Derrick Schneider also reviewed it in 2005 and claimed that he had never managed to solve it - he said he actually thought it was too difficult! Having read this introduction to the puzzle, I packed it in my bag with great trepidation - would I manage it? If not then there would be no chance at all with my Fermium puzzle. I have worked on it over the last 4 days - probably a total of about 8 or 10 hours. It moves beautifully and there are a few blind alleys to wander into but not enough to dishearten. The hardest part of this puzzle is to find the next step forward - at times I was completely stuck and unable to work out where my next move was to go; it is far too complex to just look at the pieces to see the moves. The advantage of this is that you end up going back and forth from the beginning many, many, MANY times! Giving a definite muscle memory of the pathway. I think it took me 2 days to remove the first piece and I was ecstatic! Unfortunately my jubilation was short-lived because unlike many burrs in which removal of the first piece makes the subsequent ones considerably easier - the Gordian's knot is still a huge trek to the second and third extractions. 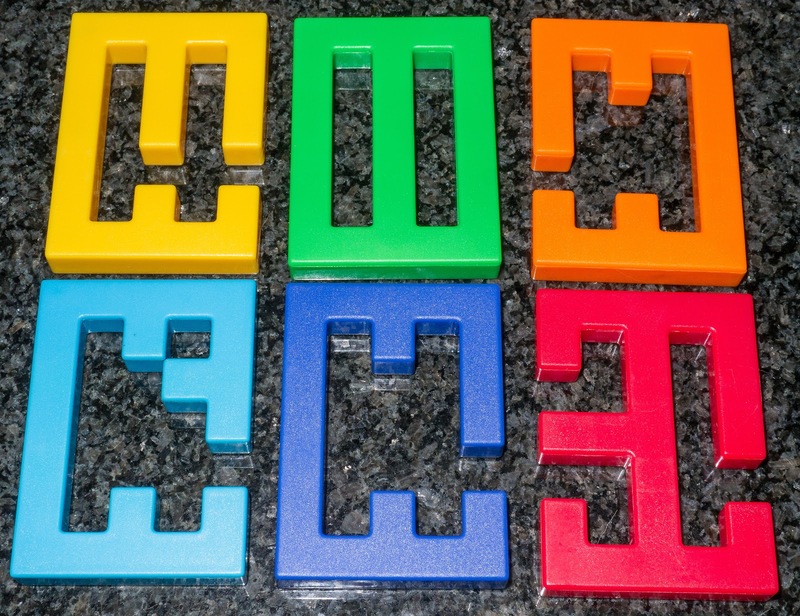 In fact even when you have only 3 pieces left, it takes a considerable amount of exploration to separate them - this puzzle is so interlocked that the name of Extreme Torture or Gordian's knot is perfectly justified. These pieces look so innocent! Finally after 4 days I upset Mrs S by letting out a huge shout as the final piece came off whilst we were watching TV yesterday evening. Now, obviously I could reassemble it with aid from the booklet or from Burrtools but the real question was could I manage to reassemble it from memory of my disassembly? It really took me some time to do it but I am delighted to say that yes I can do it. I have done it from memory many times now and it is always a struggle but is great fun. My burrtools file is available if anyone would like it - just Contact me. This is an absolutely TREMENDOUS puzzle! It may look like a plastic child's toy but it most definitely is not! I can heartily recommend it to ALL serious puzzlers and you really should try to do it yourself without aid from the booklet (consider that for emergencies only). It is extremely good value at $12 in the US from ThinkFun and other outlets - Puzzle Master do not carry it at present, but I am sure they will have it in stock again. In Europe, it is carried by Tomas Linden of Sloyd.fi - buy it - you won't regret it. Fermium - will I ever manage it? I have one as well and never managed to put it back together properly (there are some easier solutions) without some help. But for me, the real puzzle is an industrial one. How can they make them so cheaply when it takes me so long to put it back together reading the solution. Arnaud, I have had only a little difficulty putting it together because of my technique of disassembly! I literally go back and forth from beginning to each step many many times. By the time I took the first piece out, I had probably put gone through that pathway over 100 times! From this, I was so familiar with the look of each stage, that reassembly was just a matter of working out how to get from point A to point B - I didn't memorise the pathway but just knew where to aim for. The Gordian Knot can be completely disassembled in 35 moves (or less)! Is BurrTools wrong? No, it is just that rotational moves are possible. When I first bought this puzzle, about 5 years ago, it only took me about half an hour to get it apart. As a more experienced puzzler, you may have realized that rotations were "illegal". But 5 years ago, I didn't know this and it made the puzzle easier! BUT ... using such shortcuts makes reassembly nearly impossible, because I can't remember how to reverse a rotational solution. So I always use the book to get the puzzle back together! well this post is ancient now but does anyone know of a currently active seller in acrylic, fiberglass, or even aluminum/metal? Rainer Popp sells locks in metal via various distributors (you've got to be quick) and Wil Strijbos says puzzles in many different materials including aluminium, steel and acrylic. To buy from a manufacturer have a look at LaserExact at this URL.